Raccoons share a common ancestry with bears, and they originally lived in forests close to waterways. Like their cousins, raccoons are true omnivores who eat a wide variety of foods, including nuts, seeds, fruits, eggs, insects, frogs, and crayfish. They will eat whatever is available, using their dexterous paws to pluck morsels from small hiding places. Raccoons possess acute senses of sight and hearing and a highly developed sense of touch. A raccoon’s forefeet are extremely agile and resemble human hands with their five slender fingers. Highly independent and somewhat solitary creatures, raccoons are nocturnal. They hunt at night camouflaged by their distinctive coats and rest by day in the hollows of high trees. Though humans have occupied the vast majority of their traditional habitat, raccoons are opportunistic and curious animals and have learned to coexist with people. 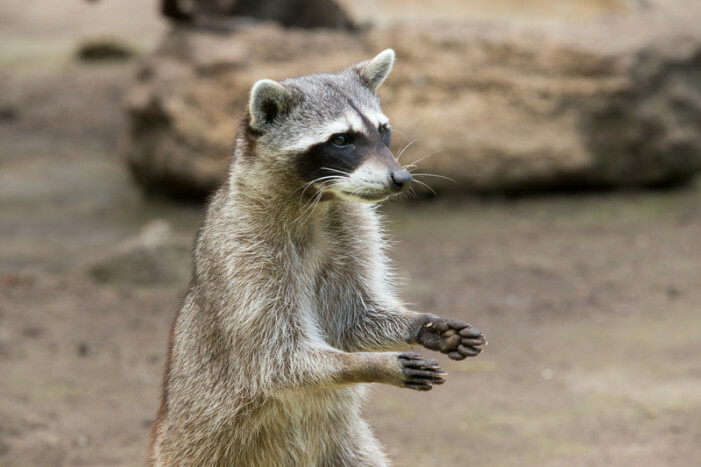 For these reasons, close encounters between raccoons and humans are extremely common in urban and suburban areas. These clever, gregarious animals with the characteristic black mask surrounding their eyes have been known to pry the lids off sealed garbage cans, raid campsites and coolers, and even turn on the tap for a drink of water. While some people take great delight in watching raccoons’ nightly antics, others consider the animals’ high jinks a nuisance. Thankfully, there are plenty of humane, common-sense solutions to perceived conflicts with these wild animals. Raccoons are widely known for their unusual habit of “washing” their food or hands in water. In fact, the scientific name for the raccoon is Procyon lotor, the Latin word “lotor” meaning “washer.” Many theories have been proposed to explain why raccoons engage in this interesting ritual, but most scientists believe that it is related to raccoons’ innate tendency to forage for food near water sources. Because raccoons are opportunistic feeders, the key to resolving conflicts with them is to contain available food sources. Once food is contained, raccoons will move on. Seal garbage cans (use bungee cords on lids), cover compost bins, and place netting over fish ponds. Putting out garbage on the day that it will be picked up will discourage raccoons from frequenting the area. Feed companion animals inside or be sure to remove any food placed outside when the animals are finished eating. Most importantly, never feed wildlife! Also, keep an outdoor light or radio on at night or use motion-detector lights or sprinklers to deter raccoons. Raccoons give birth from January through June and often use attics and chimneys as dens to raise their young. If you discover a family of raccoons nesting in or around your home, the animals should not be removed until fall (when nesting season has ended) in order to avoid separating young raccoons from their parents. It is inhumane to let the little ones starve to death, and the mother will also try frantically to reach her young and could damage your property in the process. Young raccoons do not venture out of the nest until they are 8 to 9 weeks of age. Trapping and moving the family is not recommended because it will almost certainly separate the mother from her young. Furthermore, relocating solitary raccoons or small raccoon families is illegal in most places and will likely result in their being mauled and killed by resident raccoons. When you’re certain that the young raccoons have left the nest, frightening devices, such as a portable radio or a mechanic’s light, can be used to evict the animals. Making the area as smelly as possible by placing a few ammonia-soaked rags is a very useful deterrent. Because raccoons are nocturnal animals, evicting them is easiest around dusk when they begin their nightly routines. Storms, dogs barking, or other atypical outdoor disturbances can delay eviction. If raccoons must be evicted during nesting season for safety reasons, it can take several days for a mother to move babies to a new nest once humane deterrents are in place. Once you are certain that the raccoons have left, carefully inspect the area for animals before installing exclusion devices. Install a chimney cap and repair and seal openings. Never use smoke or fire to drive animals out of chimneys. This will almost certainly kill young animals who are not physically able to leave on their own—whether they be raccoons, squirrels, opossums, or birds. Once areas are sealed, watch and listen for signs that young animals have been trapped inside, including young animals crying out or moving inside walls or fixtures, mothers pacing in the vicinity, or mothers scratching, chewing, or pawing at the area. If you discover that young animals have been sealed inside, reopen the sealed area immediately so that the mother can attend to her young. If for some reason you find an adult raccoon in your home after you seal off points of entry, remain calm. If left alone, raccoons will not cause any harm. The best thing to do is to close openings providing access to other parts of the house, open windows and doors through which the raccoon can exit, and then wait quietly for the animal to escape.